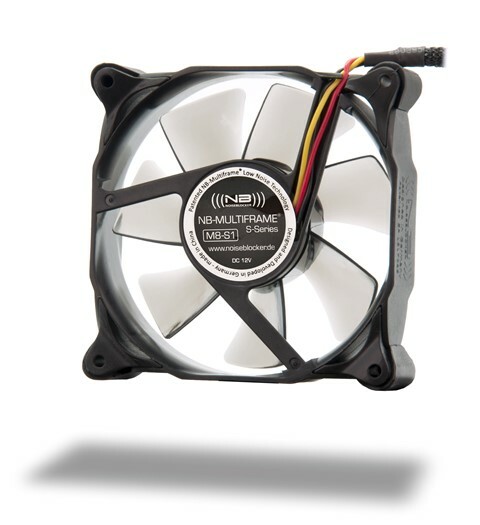 The Noiseblocker NB-Multiframe M8-S1 80mm x 25mm Ultra Silent Fan is part of the family of Germany's quietest fans. The new Multiframe® technology uses silicone rubber corners to mount the fan, making it as quiet as possible. The NB-NanoSLI® bearing is also vital in providing the fan with its near silent performance and long lifespan that earns it a 6 Year warranty. Noiseblocker fans are the new standard in the industry of quiet computing! MTBF at 25°C: 180,000 hrs.